Mrs. Dorothy (Honey) Arbury studied with Fredericks when she attended Kingswood School at the Cranbrook Educational Community in Bloomfield Hills, Michigan, in the 1930s. She met him through her uncle, Alden B. Dow, a prominent architect in Midland, Michigan, with whom Fredericks worked on architectural sculpture projects. In 1963, Mrs. Arbury was on the founding Board of Control of Saginaw Valley College, which later became Saginaw Valley State University (SVSU). She remained active on that board and on the SVSU Foundation Board into the 1990s. Mrs. Arbury and her husband, Ned Arbury, and Fredericks and his wife, Rosalind Fredericks, formed the idea of a permanent exhibit of Fredericks' work adjacent to the university's then-new facility for the art, music and theater departments. SVSU and the Arburys worked together toward an agreement to have the Marshall M. Fredericks Sculpture Gallery and Sculpture Garden built adjacent to the art department. The gallery opened to the public in the Arbury Fine Arts Center in May 1988. About half of the $7.2 million of private money raised for the building went to design and construction, restoration, transportation and installation. Fredericks oversaw installation of the more than 200 mostly plaster models in the permanent exhibit gallery. Through the years, private donors have made it possible for some of the bronze casts to be made for the Sculpture Garden. Fredericks gave the balance of the collection in 1994. After his death in 1998, the gallery received his remaining tools, equipment, archives, architectural site models, sculptures and more. With the growth of the collection, the Board of Advisors elevated the gallery to museum status in 1999. In October 2003, the $2.5 million Phase II Capital Campaign expansion became a reality, nearly doubling the museum's size. The addition includes the Sculptor's Studio, a classroom, archives vault, research reading room, two temporary exhibition galleries and a gift shop. 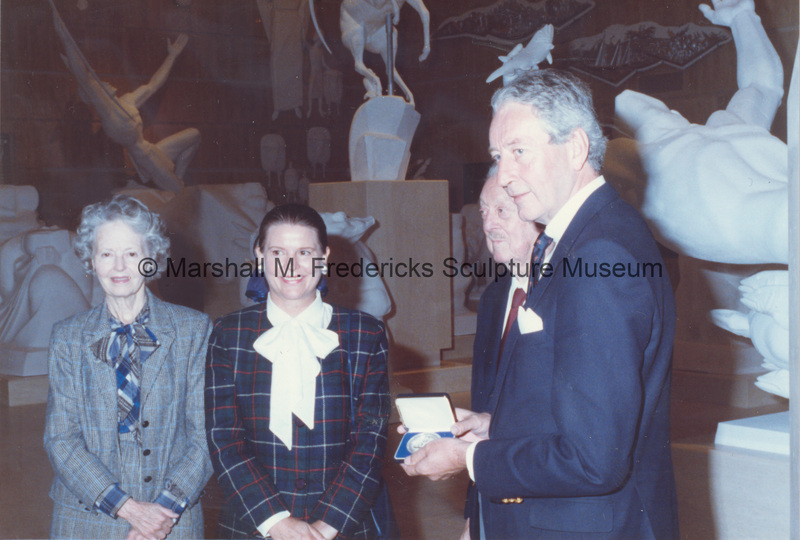 “Danish Ambassador to the U.S. Peter Dyvig displays the "Flying Wild Geese Medallion" for all to see at the Marshall M. Fredericks Sculpture Museum,” Marshall M. Fredericks Sculpture Museum, accessed April 22, 2019, http://omeka.svsu.edu/items/show/4219.